El Calafate. We arrived in El Calafate on an almost sunny and not especially windy day. For Patagonia late season standards this was rather perfect weather. El Calafate is a very touristy but neatly designed town which is equipped with lots of mountaineering shops and plenty of restaurants. When we arrived in the afternoon, we still had enough time to go see the nature reserve just outside of town on the shores of lake Argentina. Apart from flamingos, a myriad of other birds live here which we clumsily and more or less unsuccessfully tried to identify. But they were pretty birds for sure. The next day we went to see Perito Moreno, the huge and famous glacier just 80 km outisde of El Calafate (that equals an approximately 1 1/2 h bus ride). We spent an awesome day at the glacier during which we observed some impressive glacier calvings (that is the event of massive pieces of ice breaking off the main glacier into the water undeneath) and went on a boat ride on lake Argentina. The highlight of the day, however, was our little hike on the glacier. Equipped, of course with crampons and ice axes (mostly in the save hands of our guides, but sometimes we could borrow them) we explored the glacier. Our guides were lovely fellows who made sure we only looked down into crevasses without falling in. Our perfect day ended with a glass of whiskey on glacier ice rocks and a delicious alfajor (we have already told you about these awesome cookies in one of our recent blogs). Where to sleep: Bla Guesthouse – friendly and helpful staff at good prices. Where to eat & drink: Ananda – a lovely situated restaurant overlooking lake Argentina and serving big portions at decent prices. What to see: Glaciar Perito Moreno – if just seeing it from the distance is not enough for you, opt for tour operator Hielo y Aventura to get a close up and hands on experience. 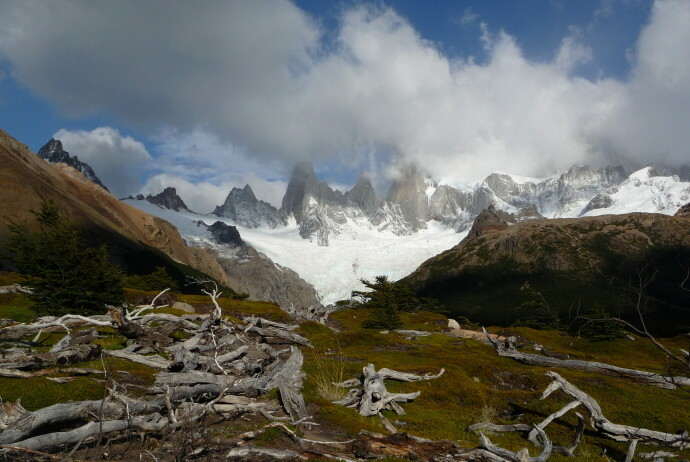 El Chaltén. Just a three hours bus ride away from El Calafate is the tiny town of El Chaltèn, the undisputed hiking capital of Argentina and also a metropole in terms of capricious and crazy weather conditions. During the 4 days we spent here, we hiked around 20km on average per day and were able to experience 4 seasons to their extremes, sometimes even within a day: We got sunburned while sunbathing on green meadows, fought our way through pouring, almost horizontal rain and eventually even got snowed in heavily on our last day. The views we got, however, especially the ones during the sunny time windows, were uniquely breathtaking and more than enough of a reward. Despite all the experienced beauty, after 4 days of hiking in El Chaltèn, we were exhausted enough to almost look forward to the 24h bus ride to Bariloche*. Where to sleep: Apartments Complejo Como Vaca – as chances are high you will have some rainy days, it’s great to have your own little refuge where there is enough space to hang up your cloth to dry – this place will provide you with all that! Where to eat & drink: Cafe Matilda in El Chaltén – a place to enjoy home made meals and pass the time till the rain stopps or at least lightens up. * Sadly our thrilled anticipation for the relaxing bus ride vanished and transformed into horrified consternation at the sight of the bus.